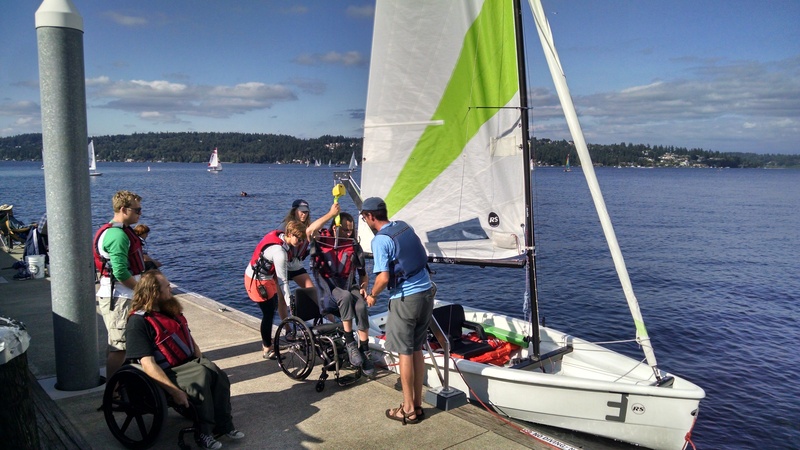 Adaptive Sailing is fully integrated into Sail Sand Point’s Programming. The majority of SSP boats can be adapted for use by a sailor with a disability, and SSP is the only location in the Northwest where a boater with a disability can come sail or paddle any day of the week during our boat rental season or take a camp or class. For sailing, this is made possible by our adaptations to many of our sailboats, for paddling we use stand-up paddle boards and kayaks. We continually work to better the accessibility of our facility and programs to all members of the community. For adults, learn to sail classes are taught in adapted boats according to the student’s needs while our youth camps are taught in Hobie Waves and kayaks. For adults who know how to sail, clinics and regattas are offered several times a year. In 2018, we hosted several 2.4 meter clinics and a 2.4 meter regatta. We also hosted several partner events for those with physical, developmental, and emotional disabilities with Outdoors for All and Seattle Parks Specialized Programs! To come sailing, suggest ideas, or join the Adaptive Committee, email info@sailsandpoint.org.